1. When Cracker Barrel served up some very special, good beans. 3. ...but delivered on the sweet melons. 4. When Applebee's couldn't find Jason, but fortunately Chili's could. 5. When Sizzler was contacted about a missing grandson. 7. ...and Chick-fil-A was up early. 8. When Denny's prepared to host Wanda's entire family. 9. When Dairy Queen was interrogated by Martha. 10. When Cheesecake Factory was there for Dave when no one else was. 11. When Wendy's was turned to in a time of dire need. 12. And when Red Lobster was thanked for food. 13. 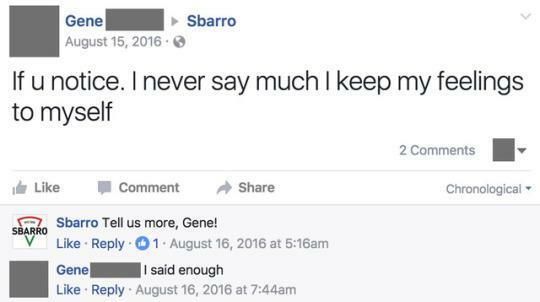 When Sbarro tried to get Gene to open up. 14. When Ruby Tuesday provided the best grill chess. 15. When Jimmy John's chatted with a first-timer. 16. When Wendy's wasn't welcome. 17. And when Olive Garden welcomed all.